The Hawkeyes Mic picks are in for the Iowa – Wisconsin game. There’s one outlier – it’s Tyler again walking around with a dark cloud over his head. Our guest picker this week is Mark Brandsgard – former Chief Clerk of the Iowa House of Representatives and a lifelong Iowa fan (also Jack’s father). Check them out – see if you agree or disagree. Iowa holds every advantage entering this game, from the home stadium to the night environment. On the field, the teams are balanced but Wisconsin’s defense has not lived up to its traditional high standards. The Badgers have a Big Ten-low in sacks with three and have allowed 6.46 yards per carry in the fourth quarter in three games. If Iowa’s offensive line can keep Stanley upright and exceed more than 100 rushing yards, the Hawkeyes should be able to grind to a win in the fourth quarter. Given the way things went in Madison a year ago, Iowa has plenty of reasons to play well against Wisconsin. Given the way things went in Madison last weekend, the Badgers have plenty of reasons to play well against the Hawkeyes. 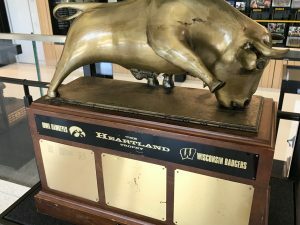 Beyond the grunts and groans in the trenches, this doesn’t promise to be much to look at and that gives Iowa a chance to get a Miguel Recinos leg up on the field in the Big Ten West. Let’s be clear, this is the Big Ten West championship game – and it couldn’t come at a better time for the Hawks. Iowa will finally have all the pieces in place. With Nick Easley back to full form and the anticipated return of Ivory Kelly-Martin and Ihmir Smith-Marsette, Iowa’s offense will be primed for its best performance of the season. And Iowa’s defense should continue its dominant play. Wisconsin brings a talented but wounded team to Kinnick, still smarting from that upset loss to BYU. With their power run game and aggressive defense, the Badgers will make this game a rock ‘em sock ‘em affair. In the end, though, it will be the magic of Kinnick Stadium at night that proves the difference. The lights, the black-and-gold stands, the Wave, the unrelenting noise, maybe alternate uniforms (there are none this Saturday) – it’s a tangible and irresistible force of its own. Ohio State and Michigan have learned that lesson. Saturday night it’s Bucky’s turn to get schooled. I haven’t seen enough from Iowa’s offense to think it can move the ball on Wisconsin with ease. That, coupled with the Badgers being angry after a tough loss to BYU, spells disaster for Iowa. The most fun number to watch on the day could be how many total punts the teams accumulate. Over/under 19? Seriously, it should be a battle, but I see the Badgers on top in a tight, classic B1G showdown. The winner of the Iowa-Wisconsin game has represented the Big Ten West each season since the East-West format debuted four years ago. This is an important game between two teams that matchup well against each other. Jonathan Taylor is the nation’s second-leading rusher (171.7 YPG). Iowa is the nation’s second-best run defense (42.0 YPG) and allow just 1.5 yards per carry. This will be a slugfest that will be determined on the ground. One differentiator is that I think Nate Stanley is a better quarterback than Alex Hornibrook. One quarterback will connect on a big play to swing the game in his team’s favor, and I think Stanley is more apt to do that. Iowa and Wisconsin are basically the Spiderman meme. Playing in Kinnick under the lights is a major advantage for the Hawkeyes, who will win a nail-biter. Damn! I should have never told Mark what my prediction was going to be. Oh, well. Probably just a coincidence – right? All of the predicted scores this week look a lot alike anyway. This is a season where it actually appears that Iowa’s Defense may be a notch better than Wisconsin’s. And Iowa’s Offense came out of its early-season slumber last Saturday – albeit against UNI (which is not Wisconsin). The Hawkeyes also get good news with the return from injury of Ivory Kelly-Martin, Ihmir Smith-Marsette, and Cole Banwart. They will need all hands on deck to put points on the board against the Badgers challenging multiple defensive schemes. I like me some Nate Stanley over Alex Hornibrook. And Brian Ferentz has schemed this game out since the bus ride back from Camp Randall Stadium last November. I think that pays off. And I believe Iowa wants to show the Big Ten it’s D is every bit as good – or better – than Wisconsin’s. Hawkeyes Mic Hawkeyes-Badgers Content and Coverage is here.